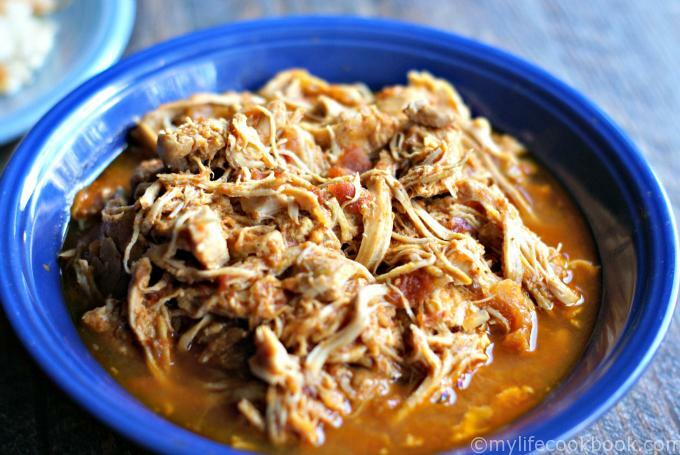 This slow cooker salsa chicken is easy to make and tastes delicious. Use it for tacos, on salads or rice bowls or even with your eggs in the morning. Low carb and Paleo too! 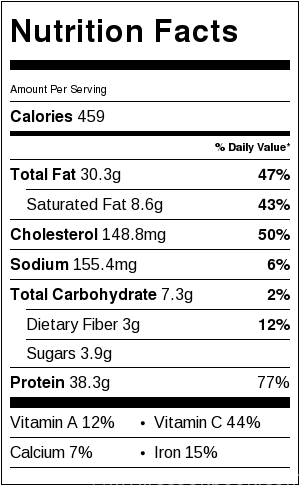 Only 4.3g net carbs per serving. I’ve seen slow cooker salsa chicken recipes a lot on Pinterest lately and thought I’d give it a try. I made my slow cooker chicken verde recipe many times and it’s a family favorite so I thought they would like this one too since it’s so similar. I made a huge amount of this because it’s so versatile. I made quesadillas for my son (which he loved) and a rice bowl for my hubby. Mine is pictured above with cauliflower rice. Without the sour cream I would consider this a Paleo dish and it’s definitely lower carb. Also you can eat this on a salad or nachos and even with your eggs in the morning. See, it’s very versatile. Plus this makes a huge batch so you can freeze half for another time. I felt that this was a really easy recipe. You basically put all the ingredients in the slow cooker and let it simmer all day. When it’s done, take out the chicken and shred it. Then use a hand blender to blend the sauce and put the shredded chicken back in the slow cooker to soak up that yummy stuff. Easy peasy. However you could make this easier if you wanted. You could use store bought sauce. I’m sure it would taste delicious too if you had a favorite one. I am partial to a homemade salsa so I just put the ingredients that I would use for that in the slow cooker and let them cook down with the chicken. I used a combination of boneless, skinless chicken thighs and breasts. You could use one or the other if you have a preference. I’m starting to like chicken thighs because sometimes breasts are too dry. In this case I don’t think it would be a problem because of the sauce. Oh and I thought of one more use for this dish. Make a Mexican soup with it. I might just have to do that with some of the left overs and make another post of it. In the meantime enjoy this super easy and tasty dinner that has so many uses. Check out the nutrition information below if you are interested. Enjoy! 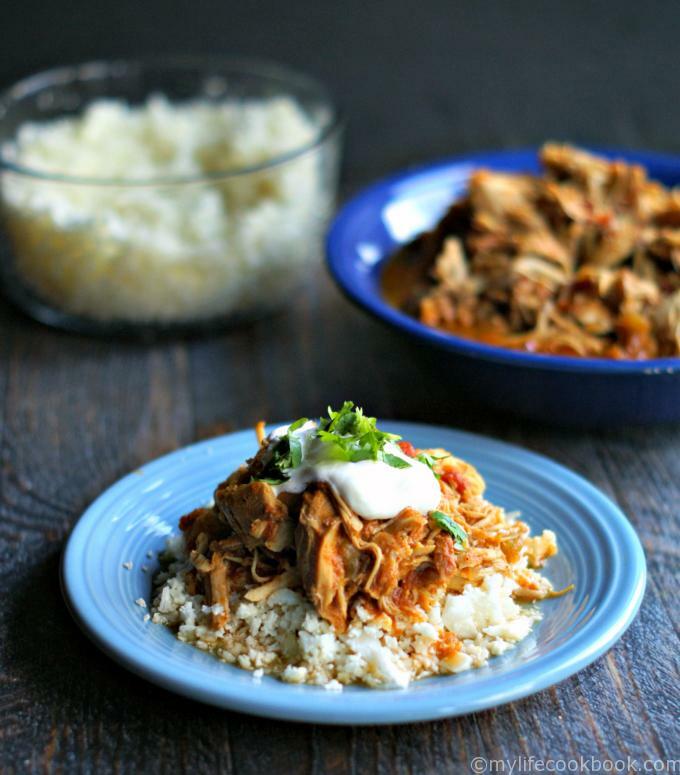 This slow cooker salsa chicken is easy to make and tastes delicious. Use it for tacos, on salads or rice bowls or even with your eggs in the morning. Low carb and Paleo too! Add your chicken to the slow cooker. Top with onions, garlic, and chillies. Add salt, cumin, oregano and lime juice to the tomatoes and mix before pouring over the chicken. Cover and cook fro 6-8 hours. When the chicken is cooked, take it out and place in a bowl and shredded. Using a hand blender, blend the contents of the slow cooker to make it a nice, smooth sauce. 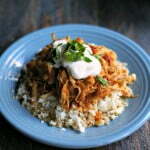 Place the shredded chicken back into the slow cooker and let cook another 5 minutes. Serve as quesadillas, tacos, on lettuce, on rice or even eat it with eggs for breakfast. Previous Post: « Cashew Curried Vegetable Rice – Easy Healthy Side Dish in 10 minutes! This is one of my fave crock pot meals! Love your pictures for this amazing meal! My MIL makes aversion of this but she doesn’t do spice nor a whole lot of seasoning so this sounds WAY better! Always good to have recipes like this for an easy meal. 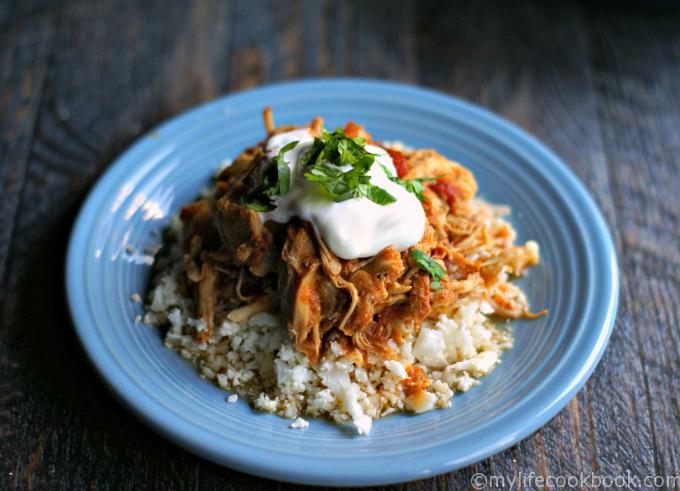 I make something similar with sofrito I call “pulled chicken” and I need to try your slow cooker version. Pinned! I love salsa chicken. I used to make this but totally forgot all about it. Thanks for the reminder of such a tasty and easy recipe! Well it’s a first time for me and I’m so glad I learn about it! Nothing beats a slow cooked staple like this–the uses are endless.